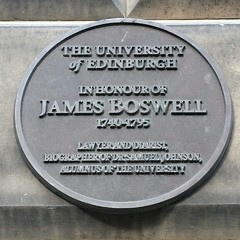 James Boswell, 9th Laird of Auchinleck (/ˈbɒzˌwɛl, -wəl/; 29 October 1740 – 19 May 1795), was a Scottish biographer and diarist, born in Edinburgh. 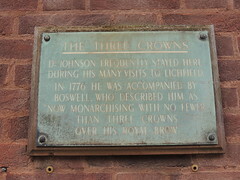 He is best known for the biography he wrote of one of his contemporaries, the English literary figure Samuel Johnson, which the modern Johnsonian critic Harold Bloom has claimed is the greatest biography written in the English language. 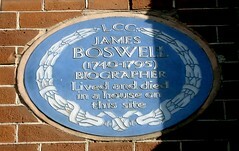 Boswell's surname has passed into the English language as a term (Boswell, Boswellian, Boswellism) for a constant companion and observer, especially one who records those observations in print. In A Scandal in Bohemia, Sir Arthur Conan Doyle's character Sherlock Holmes affectionately says of Dr. Watson, who narrates the tales, "I am lost without my Boswell." 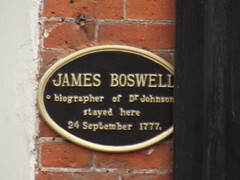 James Boswell biographer of Dr Johnson stayed here 24 September 1777. 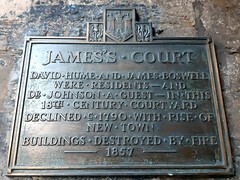 In honour of James Boswell 1740 - 1795. 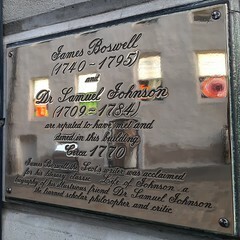 Lawyer and diarist; biographer of Dr Samuel Johnson. Alumnus of the University.